Join Us!!! We are looking for someone to help us cover Qatari women basketball. Please send us an e-mail. Al Karkh (IBL) agreed terms with 27-year old American power forward Joshua Caldwell (203-98kg-91, college: William Penn, agency: SDJ Sports). Caldwell started the season at Al Wakrah in Qatari D1 league. In 16 games he had very impressive stats: 21.0ppg, 6.3rpg, 3.4apg and 1.3spg this season. A very spectacular year in his career as he was named to Asia-Basket.com All-Qatar D1 Honorable Mention. The last summer he played at Punto Rojo (National League) in Ecuadorian league where in 6 games he recorded 10.7ppg, 6.2rpg and 1.7apg. Caldwell has played previously professionally in Finland (LoKoKo Bisons) and Italy (FP Sport Messina). Caldwell attended William Penn University until 2016 and it is his third season as a professional player. Lenny Daniel (203-PF-87, college: CS Northridge) came up with decisive points in the final two minutes of play as Al Rayyan edged out Al Sadd 80-77 to win the Amir Cup basketball tournament at the Al Gharafa Sports Club last night. In an entertaining final which saw the lead changing nine times, Daniel was deservedly the top-scorer with 23 points with a 60% success rate in field goals attempted. Al Rayyan trailed Al Sadd by two points (62-64) going into the final quarter, but produced an 18-point effort in the final 10 minutes while Al Sadd could only muster 13. The match began at a cracking pace but there was precious little that separated the teams in the opening 10-minute period during which they scored 19 points apiece. Al Rayyan took a 45-40 lead after the second period, although a whopping 24-point effort by Al Sadd brought them back into the game. But a solid defensive performance by Al Rayyan eventually helped them clinch the prestigious Cup. Tanguy Ngombo (197-F-84) was the second-highest scorer for Al Rayyan with 14 points while Abdelrahman Abdelhaleem and Mohamed Hassan Mohamed had 12 each. For Al Sadd, Dominic James (180-PG-86, college: Marquette) excelled with 18 points, while captain Mustafa Fouda had 16 and Faisal Abuissa and Devin Green (201-G/F-82, college: Hampton) 14 each. Al Sadd scored 19 points from turnovers while Al Rayyan just had five. However, Al Rayyan excelled with 14 second chance points. In the end they led for 23 minutes of the action which stood them in good stead. 'It was a tough game but I congratulate my players for pulling off an excellent victory,' Al Rayyan coach Erik T Rashad said. Al Sadd came up with a sensational third quarter display to record an 87-81 win over Al Arabi in the semi-finals of HH the Amir Cup basketball tournament at the Al Gharafa Sports Club yesterday. Devin Green (201-G/F-82, college: Hampton) with 24 points and Dominic James (180-PG-86, college: Marquette) and Moustafa Fouda with 18 excelled for Al Sadd, while Kevin Galloway (200-PG-88, college: Texas Southern) shone for Al Arabi with 22. Following a neck-neck-neck first two quarters after which Al Sadd trailed 42-46, it required a spirited effort to claw back into the game and earn the right to fight for the prestigious trophy. And that was exactly what they did as they scored 20 points and their defence restricted Al Arabi to just six to take a comfortable 62-52 lead into the final 10 minutes. So effective was the Al Sadd defence in the third quarter that Al Arabi couldn't add to their score of 46 in the first five minutes. In that corresponding period, Al Sadd scored eight points, adding 12 more in the next five minutes to turn the match in their favour. Al Arabi were left shocked at the sudden turn of events and tried their best to come back into the match. They surely made a fight of it, scoring 29 points in the final quarter, but Al Sadd also added 25 points, eventually 10-point advantage, standing them in good stead in the end. 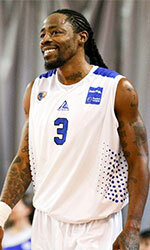 Champville (LBL) inked experienced 34-year old American guard Demarius Bolds (193-88kg-84, college: Missouri Western). It is actually his comeback to Dik El Mehdi as he has played here before. Bolds played recently at Al Arabi in Qatari D1 league. He managed to play in three leagues this year (!!!). Bolds also played for Champville earlier that season where in 10 D1 games he averaged 12.2ppg, 2.8rpg, 1.7apg and 1.8spg. The other team Bolds played shortly was GS Kymis (A1) in Greek league. In 6 D1 games he had 10.8ppg, 4.0rpg, 2.3apg and 1.7spg. Among other achievements Bolds' team made it to the Gulf Coast Championships Semifinals in 2018. He received also Asia-Basket.com All-Gulf Coast Championships 1st Team award in 2018. Bolds is a very experienced player. He has quite traveled the world as his pro career brought him to twelve different countries on three different continents (Europe, Asia and of course North America). Bolds has played previously professionally in Bahrain (Muharraq), Iraq (Nift Al-Janoub), Lithuania (Lietkabelis), Romania (Targu Mures), Turkey (Final Spor), United Kingdom (London Lions), Greece (Apollon Patras and Lavrio), Qatar (Al Rayyan and Al Wakrah), Czech Republic (BK Kolin), Kosovo (Bashkimi), Lebanon (Al Moutahed) and ABA (St.Louis S.). He is close to retirement age as a player. It may be one of last seasons in his extensive career, which he may end at Champville. Worth to mention Bolds played also at Eurobasket Summer League, which helped him to get the job in pro basketball. He attended Missouri Western State College until 2006 and it is his 13th (hopefully lucky) (!!!) season in pro basketball. Bolds' game is described as: A very athletic combo guard who does everything. He is a great slasher to the basket and finishes above the rim with either hand. Defensively he is a star who plays with a lot of intensity. He is a big time talent and a great all around player who can do it all.